Home Blood sugar Is cinnamon the next tumeric? 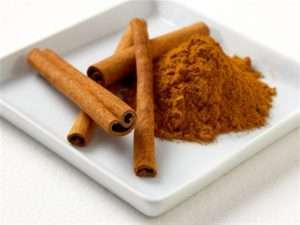 Cinnamon is a spice used in savoury and sweet dishes. However its big interest in the health community is for its medicinal properties. Cinnamon Zeylanicum can help settle the digestive system. It relieves nausea, vomiting and is anti bacterial. It helps anything from athletes foot to indigestion. Cinnamon Zeylanicum can be used to prevent nervous tension and banish hopelessness. It is hugely uplifting and energizing, transforming low vitality into zest for life. It is also mentally stimulating and can relieve mental exhaustion and nurture fresh thinking and creativity. Not bad so far!